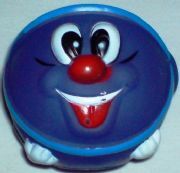 A vinyl Blue ball decorated with a smiley face which squeaks when bitten. Carded and Bagged. From 35p. A vinyl toy that is yellow in colour with the features of the toy highlighted in red which squeaks when bitten. Carded and bagged. From 35p. A vinyl green ball decorated with a smiley face which squeaks when bitten. Carded and Bagged. From 35p. 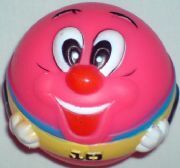 A vinyl pink ball decorated with a smiley face which squeaks when bitten. Carded and Bagged. From 35p. A vinyl squeaky dog that squeaks when bitten. Carded and bagged from 50p. A squeaky melon with a comical face. This item is carded and bagged. From 35p. Squeaky mobile phone which squeaks when bitten. From 35p. Squeaky hammer dog toy with a comical face that squeaks when bitten. Carded and Bagged. From 30p. A vinyl hedgehog which squeaks when bitten. Huge discounts for wholesale. Carded and bagged. From 30p.